Don't you love it when you pick up a piece of clothing that seems to work with everything? That is what I'm finding with this lace pencil skirt. I had tried this on about 2 months ago and waited patiently for it to go on sale. I talk often about how I'm attracted to colour and this blue just pulls me in every time. The fact that it is lace is an added bonus. I wore this outfit to my jewelry show this past weekend. Let's talk Christmas. I might well be known as The Grinch in my neighbourhood. We haven't put up any lights or decorations, no tree and I turn off Christmas music every time I hear it. I don't mind Christmas…on Christmas Eve or Christmas Day. I've been like that for a few years now. It just seems that the whole idea of Christmas has become so commercialized. It is hard to find the warmth that Christmas used to carry in the over crowded malls and parking lots with everyone fighting for parking spaces and swearing at each other. I do have what I consider a valid excuse for not putting up decorations as we often go away for the holidays. This year we are hoping to score a last minute deal to somewhere warm…fingers crossed. Last year we travelled to be with family. We don't buy each other gifts as the traveling is our gift. It's a sensible solution to the buying frenzy that seems to happen every year. 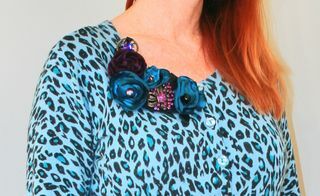 Love the print and lace mix and your necklace/brooch is really pretty with it! Cute outfit! and I love the header of your blog! 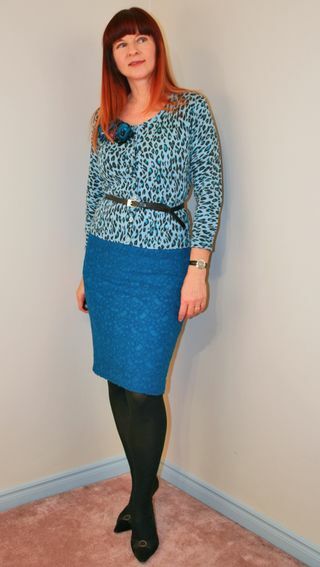 Beautiful look,very unique blue leopard with blue top! I’ve been feeling a little of the same way about Christmas this year. We finally put up our tree this week only b/c my daughter (9yrs) cried b/c we were the only ones in the neighborhood w/o our tree up. I think she’s a little dramatic, but nothing like a little mom guilt around the holidays. Sending out good thoughts that you get to someplace warm this holiday! the blues look really nice together. i love those unexpected pieces that end up being favorites.